Seattle Locksmith Security offers the best and most exclusive residential locksmith service in Seattle. We are located at 3214 Rainier Ave S, Seattle, WA 98144. We are open 7 days a week from 9 AM – 6 PM. We offer many residential locksmith services: home lockout, home re-key, residential lockout, residential re-key, garage door lockout, garage door re-key, electronic keypad installation, electronic keypad reprogramming, bathroom door lockout, key stuck in front door, mailbox re-key, mailbox lock installation, key stuck in back door, and many other residential locksmith services. Seattle Locksmith Security offers residential mobile locksmith service 7 days a week from 7 AM – Midnight. Our mobile locksmith service vans are equipped with the latest and most advanced locksmith technology. Call us today at (206) 823-2288. Our dispatch will send you a professional residential locksmith technician to your location within 60 minutes. Each of our residential locksmith technicians have the experience, tools, hardware, and equipment to solve your issue on-site. We have seen it all. Our job is to help you, plain and simple. Rest assured we are here for you. We are licensed, bonded, and insured. All of our of hardware installations are 100% guaranteed. Seattle Locksmith Security also offers residential locksmith shop services. You can stop by our location to duplicate keys, re-key locks, replace mailbox locks, fix locks, and anything you need help with. Our location offers free parking and is conveniently located next to the Mount Baker Link Light Rail Station. Our friendly residential locksmith technicians are always available to answer your questions and help you with all your residential locksmith needs. For a nominal fee we can also schedule a residential locksmith walk through to advise you on what you need to secure your home. Everything from doorjambs to electronic keypad installations, we will customize to your needs. Seattle Locksmith Security is rated 4.9 / 5 based on 134 reviews. | View all reviews or leave us feedback. In addition to providing in-shop services, we also provide mobile service seven days a week from 7 AM to 11 PM. Our mobile services include, but are not limited to: emergency automotive lockout, residential lockout, trunk lockout, keys made on site, residential re-keying, safe opening, installation of security systems, converting safe from dial to digital, commercial lock installation, storefront lock change, high-security lock installation, commercial keypad installation, and much more. Hours:Mon-Sun 9:00 a.m - 6 p.m. 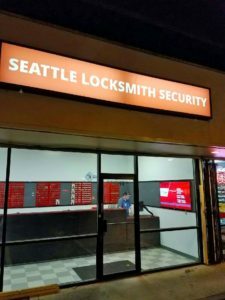 Mobile Hours: 7:00 a.m. - 11:00 p.m.
We provide fast locksmith services at our new store location and offer mobile locksmith services throughout the greater Seattle, WA area including all Seattle zip codes: 98101, 98102, 98103, 98104, 98105, 98106, 98107, 98109, 98112, 98115, 98116, 98117, 98118, 98119, 98121, 98122, 98125, 98126, 98133, 98134, 98136, 98144, 98154, 98164, 98174, 98177, 98195, 98199.